Singapore has recently submitted its Intended Nationally Determined Contribution (INDC) to the United Nations Framework Convention on Climate Change (UNFCCC) Secretariat. Each country is requested to submit their INDC before the Conference of Parties in Paris in December this year so as to facilitate the development of a new global climate agreement for the post-2020 period. 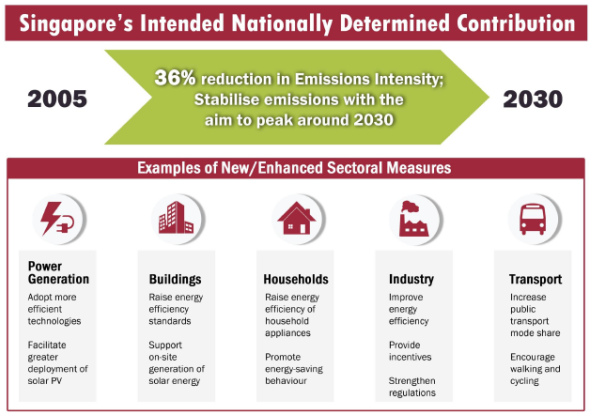 Singapore’s INDC states that it intends to reduce its Emissions Intensity (EI) by 36% from 2005 levels by 2030, and stabilise its emissions with the aim of peaking around 2030. Singapore’s Emissions Intensity or greenhouse gas (GHG) emissions per S$GDP (at 2010 prices) in 2005 is 0.176 kgCO2e/S$. A reduction of 36% would mean that Singapore’s EI in 2030 is projected to be 0.113 kgCO2e/S$. Although Singapore currently accounts for around 0.11% of global emissions, we are still committed to be a responsible country and reduce our emissions. Singapore had previously pledged in 2009 to reduce its emissions by 7% to 11% below its business-as-usual (BAU) level by 2020, and if there is a legally binding global agreement, to reduce its emissions by 16% below BAU level by 2020. What does Singapore’s INDC actually mean? Is it good or bad? 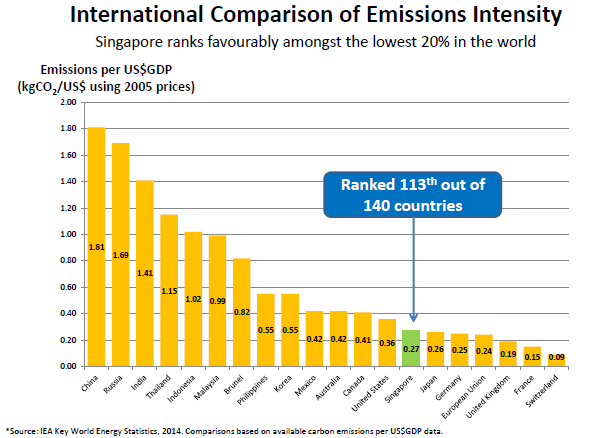 Is Singapore right in using emissions intensity rather than absolute emissions reduction? Emissions intensity (EI) is the ratio of GHG emissions to a measure of economic output, while absolute emissions quantifies the amount of GHG emissions. This means that a reduction in EI does not necessarily result in a reduction in absolute emissions. Absolute emissions will fall if the percentage reduction in EI is greater than economic growth. We need to consider absolute emissions for global climate change mitigation efforts and negotiations as it is absolute emissions buildup in the atmosphere that we are concerned about. However, using EI also make sense as it can indicate whether a country is more carbon efficient in producing goods and services compared to other countries and over time. For example, the graph below shows that Singapore’s EI is ranked 113th out of 140 countries globally (or among the best 20% of countries). Despite that, Singapore is committed to reduce its EI further. From 2005 to 2020, the planned reduction of Singapore’s EI is around 1.5% annually. For the new INDC target, Singapore’s EI would have to decline further by around 2.5% annually from 2021-2030. If Singapore only has an EI target, then some critics might be right in saying that it means Singapore will keep on increasing its emissions. However, the second (and more important) target of Singapore’s INDC states that emissions will peak around 2030. This is in fact saying that Singapore will put an absolute cap on the quantity of emissions (which is 65 MTCO2e) in 2030, taking into account economic growth and population growth. The meaning of peak emissions could imply that Singapore’s emissions level or reduce further after 2030. The Singapore government is known to under-promise and over-deliver, and is very careful in its submissions to the United Nations, so we are quite optimistic that Singapore has set a peak target that it is sure of achieving. We are pleased with Singapore’s INDC of both EI reduction and peaking emissions. Considering our limited land and being alternative energy-disadvantaged, including a target of peak emissions is even more admirable. Nevertheless, some critics are still unhappy and demand for absolute emissions to be reduced now. Actually, Singapore is already reducing absolute emissions now. Our emissions would be higher if we did not switch to natural gas and stepped up our energy efficiency, public transportation and green building efforts. Of course, we still need to reduce our emissions further in all sectors, but we can’t expect this decarbonisation of our economy and society to be achieved immediately. With the target to peak emissions around 2030 (or in 15 years), the government is in fact sending a strong and clear signal to industries, companies and individuals that we have to shift towards a low carbon Singapore. Other critics dismiss our efforts in saying that China’s INDC has also set peaking emissions around 2030 (and making best efforts to peak early) and has a higher EI reduction of 60% to 65% from 2005 level by 2030. We think that it is not fair to compare Singapore with China as China has greater scope in reducing emissions through lowering coal consumption and having more hydro, nuclear, wind and solar power. How are we going to achieve our INDC targets? What are the implications for companies? Over 90% of Singapore’s electricity is currently generated from natural gas, the cleanest form of fossil fuel. Therefore, further mitigation efforts will focus on greater energy efficiency and clean energy adoption. The government will adopt a multi-pronged approach to reduce Singapore’s greenhouse gas emissions across all sectors (see measures below). We think that the Energy Conservation Act, which mandates energy management practices for large energy users, could be further strengthened over time. Currently each company submits its own projected energy reduction in the energy efficiency improvement plan under the Act. In the future, we might see the government requiring companies to commit to a minimum percentage reduction in energy consumption, especially for the power generation companies. We think that the criteria for inclusion of companies in the Act could also be enlarged to include some companies below the current energy use threshold (54TJ of energy used per calendar year). The government will continue to push for solar energy in the public and private sectors. By 2030, it is estimated that renewable energy could potentially contribute up to 8% of Singapore’s peak electricity demand. We think that it is possible to have solar energy contribute more than 8% of energy demand by 2030. For example, the Solar Technology Roadmap developed by the National Climate Change Secretariat (NCCS) and the National Research Foundation (NRF) suggests that it is possible to have solar electricity contribute 19-30% of electricity demand in 2050, under additional to strong energy efficiency efforts and for an accelerated scenario of full utilisation of effective area and accelerated growth in photovoltaic efficiency, yield, and cost reduction. The government has sent a strong and clear signal to companies with its target to peak emissions around 2030. It is time for companies to consider climate change efforts more seriously and lower their carbon footprint and be more energy efficient. Besides companies, individuals also have to reconsider our consumption behaviour and reduce our carbon footprint in our daily lives. 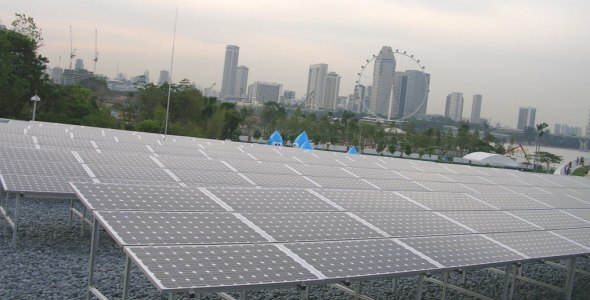 Singapore’s low carbon future starts now.